“Ahara Suddhi…” — purity of food doesn’t just lie in clean and hygiene containers, and kitchen surroundings. It is related more to the mind of people producing and consuming the food. When there is killing of life, say of the cow by butcher, the mental state of both the killer and the killed make their way into the “meat” and directly affect the mental state of whoever consumes it. Our mind, intellect, thought is nothing but the essence of what we eat. Eat wholesome food, prepared with love, and you are happy. Eat unwholesome food, food obtained by selfish and cruel means, and you are unhappy. It is as simple as that. As seekers after happiness, peace and wholesome living, we should try to consume Sattvic food – light, nourishing, and food that has not been obtained by violent means. By consuming such food we welcome many nice qualities – light-heartedness, cheerfulness, health – into our lives. If we want to develop Compassion in life, this is the place to start. Make kindness to animal life your priority beginning this year, and see how much you will be rewarded. It is very welcoming to note that in US, Vegetarianism and Veganism is growing by leaps and bounds. There are many vegetarian restaurants opening up and are doing very well. 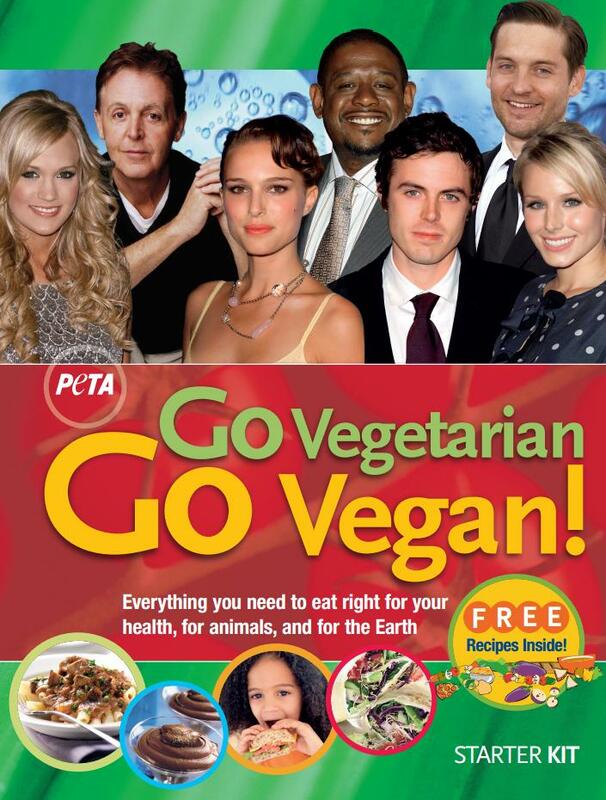 The PETA newsletter quotes famous celebrities who have switched to Vegetarianism and Veganism and who are immensely and positively impacted by the changes this brought to their lives. It is very encouraging for others to follow the lead. October is Vegetarian Awareness Month. However, you need not wait till October. You can start today and take a pledge to go Vegetarian, if you are not already. Make gradual changes so mind does not resist. The WorldVegetarianDay.org. You can browse through the below poster and the website for more information. There are so many resources available for people who want to make that positive switch. Hari & I have taken a resolve to be Vegans – an extra step ahead from Vegetarianism where even cow’s milk, dairy, cheese, butter etc are not consumed – especially in US. Going through the newsletter made us more painfully aware of how the cows are ill-treated and this is our way of resisting such treatment to life. Hari has completely switched to Soy Milk and gradually lessening the use of yogurt and butter produced here. I also decided to make the change to Veganism and this month will herald that new beginning. Hope we succeed in our endeavors ! Previous PostHappy New Year 2013 !Next PostDivine Ambrosia Winter Issue ! ur messages are always soul enhancing,but a doubt about the ayurvedic medicine pancha gavya cant be avoided &milk in limited amount is AMRIT as well!!!!!!! You are in a way right, that cow’s milk is beneficial as it is considered Sattwic. There is a little ambiguity however. In our talk with Swami Prakashananda (Chinmaya Mission, Trinidad & Tobago), he denies that it is a continuing necessity for a person to keep drinking milk in adulthood. There are mixed opinions. In small quantities, it may be ok. But Hari & I want to try a substitute like soy milk and see how it suits us. Yes, Swami Sivananda has mentioned about Charu (rice and milk). He also mentions about Havisya – a preparation of rice, milk, ghee and sugar – which he recommends during Purascharana time (a period of continuous mantra chanting). Milk is considered sattwic only, but due to the way it is extracted and the inumane treatment involved, we want to substitute with Soy Milk and give it a try.